He was killed in action at Festubert “while leading his men in a successful attack on German trenches” on 16th May 1915. Harold Jerome Lynch was born on the 9th December 1895 at Glascoed Hall. He was recorded on the census of 1901 living with his family at Glascoed Hall, Ffrith, nr Wrexham. The head of the household was Francis Lynch 41, who was ‘living on his own means.’ He was an employer and had been born in Liverpool. His wife, Josephine was 39 and she too was listed as ‘Living on her own means’, was an employer and had been born in Liscard. Their listed children were Clare M 9, Harold J 5 and Mary F 2. There were six servants, a Governess, a Nurse, a Cook, a Kitchen maid, a House Maid and a Waitress. In the next census, Harold was recorded at Stonyhurst College, a Roman Catholic boarding school in North West England. He was 15 years old. 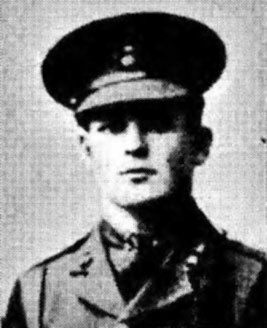 Harold was listed in the UK De Ruvigny’s Roll of Honour which tells us that at school, he was Captain of the College 1913 -14 and Captain of the Football team. He was a successful athlete, winning for two years, the mile, half mile and quarter mile. He was a member of the Officer Training Corps for two years. He applied for a Commission at the outbreak of the war and on 9th September 1914 he was ‘Gazetted’ to Reserve 2nd Lieutenant. He was promoted to 2nd Lieutenant on the 2nd February 1915 and posted to the Royal Welsh Fusiliers. He was killed in action at Festubert on the 16th May that same year when he was just 19 years old.